The GOP fears whenever workers are able to bargain collectively and seize power in their workplaces, claiming this is a bad thing, not a good thing. Republicans know that unions are one of the Democratic Party’s key sources of funding and organizing, so if they can be destroyed it means Democrats will be weaker. “NEVER confuse a single defeat with a final defeat,” wrote Scott Fitzgerald, the novelist. His namesake, Scott Fitzgerald the Wisconsin state senator, suffers no such confusion. 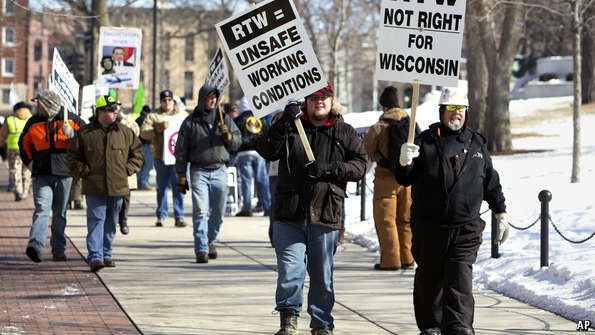 Republicans have beaten the unions once in the Badger state, but they are not yet declaring victory.